Holy popsicle week! If there’s one thing that can pull me out of hibernation it’s the promise of popsicles. 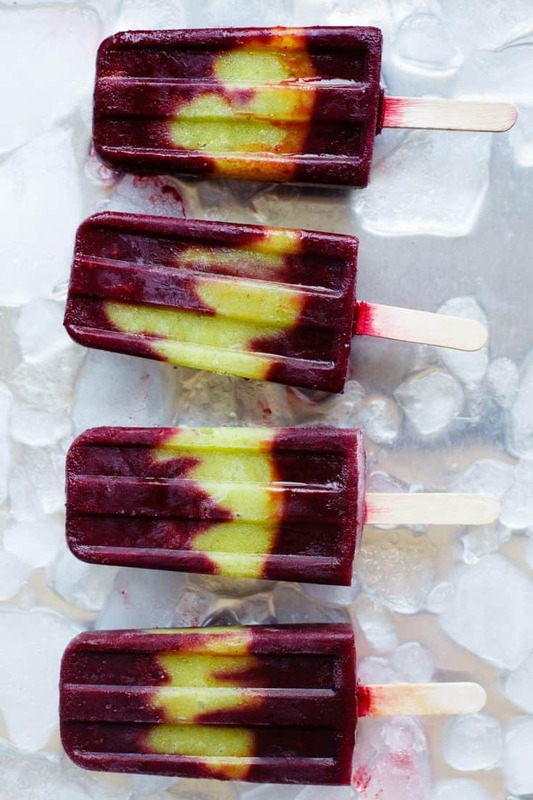 Especially if you’re talking about these blackberry fig sage popsicles. This summer has been unbearably warm and muggy in our house. When we first toured this house in the wintertime before we moved in, I remember thinking how it soaked in all the warmth and felt so cozy. A big bonus for March. But right now it’s July and it’s still doing that. I don’t want to feel cozy in July – I want to stick my head in the freezer and live there all month. So I’ve been chewing on ice and nomming my way through multiple boxes of popsicles for breakfast, lunch, dinner, dessert, and midnight snack. This is not an exaggeration – after snapping pics, I ate five of these blackberry sage fig popsicles in a row. As it turns out, even the cats love popsicles – always trying to sneak a lick when I turn away. Fending off hungry felines has become a necessary part of my popsicle routine. Earlier this week, Betty and Alanna came over to spend the day making hand pies – with the oven on for 6 straight hours. (Stay tuned for our epic picnic pie post!). We were so into pie-making that we barely noticed the house had trapped us in a sweaty hot embrace – until it came time to clean up and I wanted to crawl back into the freezer. A small price to pay for freshly baked pie though. 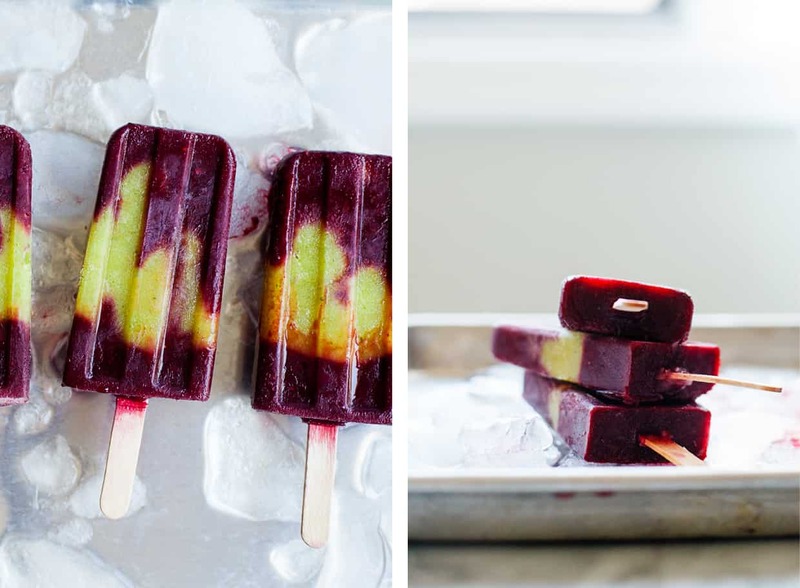 These deep magenta and green pops are the brainchild of three hungry ladies at the market. We grabbed a basket of the first-of-the-season green Kadota figs for a salad and I snatched up another basket for popsicles. 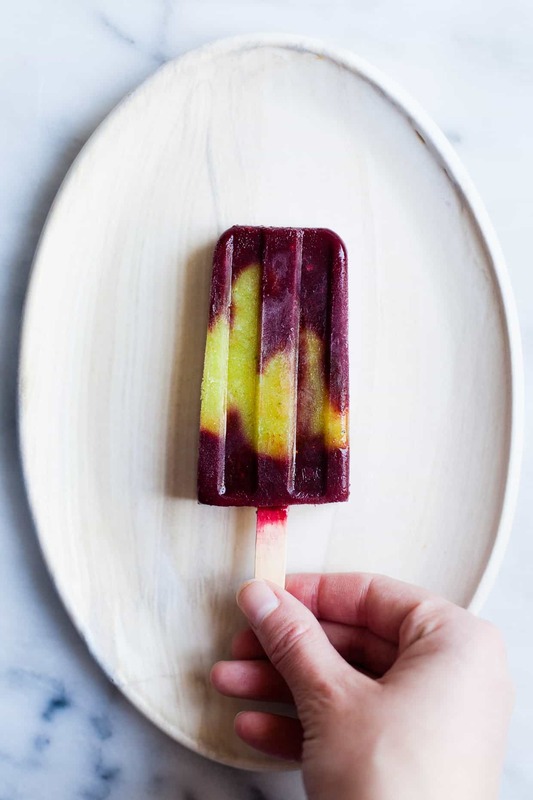 Then we used popsicle week as an excuse to linger among the seasonal summer fruit brainstorming what to pair them with for just a little bit longer. 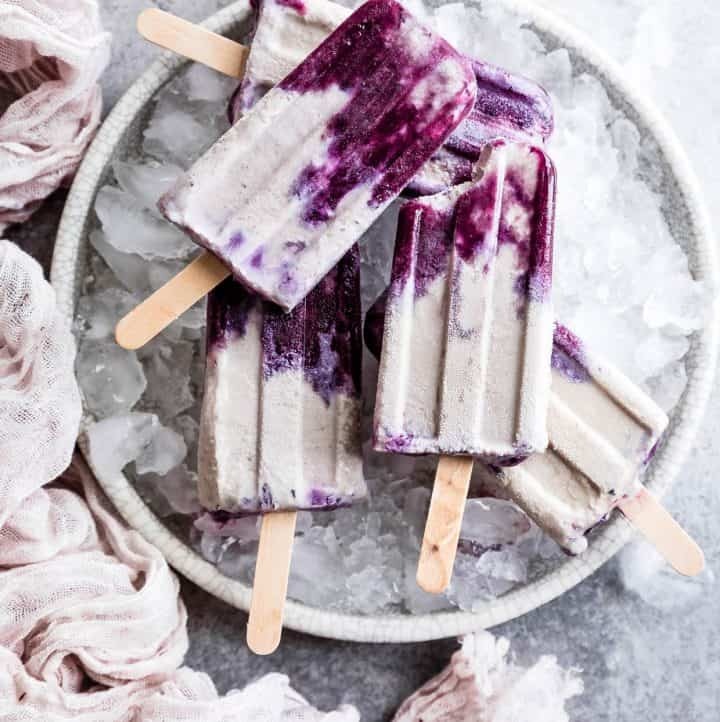 Both blackberries and figs offer a subtle sweetness that when mixed up with aromatic sage simple syrup make a vibrant grown-up popsicle. If you’re like me, you’ll eat no less than five in one sitting. Added bonus: they look like Barney. Triple bonus: Popsicle week!! 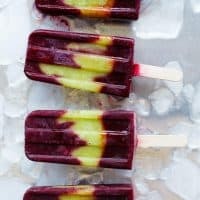 Billy’s rounding up all the popsicles going on this week from awesome bloggers around the web – be sure to head over Wit and Vinegar to get your popsicle on! 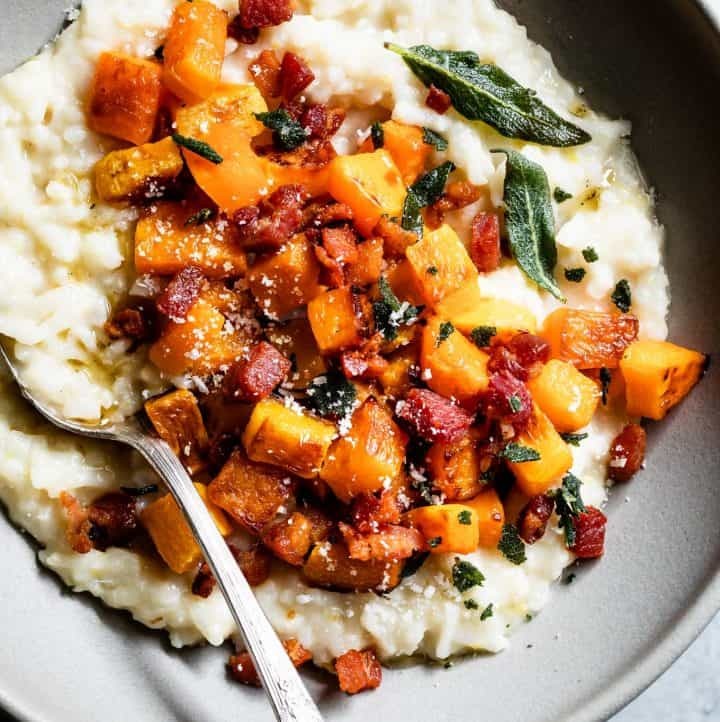 Combine the water, sugar, honey, and sage in a small saucepan over medium-low heat. Cook, stirring occasionally, until the sugar dissolves and it just begins to simmer. Remove from heat, cover, and let steep for 20 minutes. Strain the sage leaves out of the simple syrup, reserving the leaves. Add 1/2 of the simple syrup to blender with blackberries, lemon juice, coconut water, and 4-5 reserved sage leaves. Purée until smooth. Transfer to a spouted cup, like a glass measuring cup. Give the blender a quick clean and add the remaining simple syrup, kadota figs, and 4-5 reserved sage leaves. Purée until smooth. 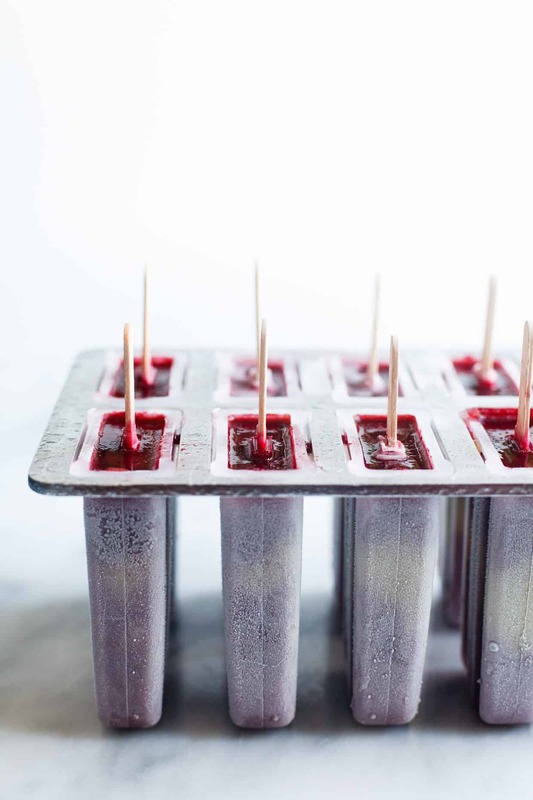 Pour about 1 tablespoon of the blackberry purée into each popsicle mold (about 1-inch high). Divide the fig purée among the popsicle molds, leaving room for another layer of blackberry purée. Divide remaining blackberry purée among the popsicle molds. Place the lid over the mold and insert your popsicle sticks as straight at possible. Freeze for 4-6 hours, or until frozen solid. For best results, freeze over night. To help remove your popsicles from the mold, fill a large bowl with warm water and briefly dunk the bottom part of the mold in the bowl, or briefly run the bottom of the mold under warm water. I just love your writing. Your description about the heat during our shoot – so accurate. Definitely an embrace that kind of snuck up on us and stayed for hours. However, it was a super fun day and I’m so excited to share it! These popsicles look amazing. The combination sounds so good and the colors really pop!!!! Loving the photos here too :). Those popsicles are beautiful! I love the colors and the flavors sound delicious. I feel ya on the heat- Switzerland is having an unusual heat wave right now and there is no air-conditioning in this country! I love and hate that fact, but I will definitely need some popsicles in my near future to deal with the heat! YES! Those colors are perfect. I’m amazed at that green from the figs. I’m also amazed that you’d turn the oven on for that long to bake pies in the heat–bless you! I was roasting in the summer heat too. But luckily, we just got AC a few weeks ago. Lifesaver! Before that, I would just melt away until the sun went down. These popsicles sound delicious. And they’re so pretty too! What a lovely presentation! This looks amazing! As for the heat, can you send it my way?? It feels like fall here and all I want is some serious heat!! I can’t wait to see those hand pies you girls came up with as well. I’m sure they were well worth ending the day in the hot kitchen! A PERFECT popsicle for such a perfect weather, Sarah. So pretty & delicious looking that I can’t wait to try it. Hahaha I can totally relate to fending off felines…lately our lion of a cat, Orion, has been eating human food because Selah always drops something and he cleans it right up! At least he’s helping with chores i guess…? And how pretty do these look?! They take me back to childhood when I actually used to eat popsicles. ;P Also, those popsicle molds look so cool. I’m such a sucker for cool and stylish kitchen items. Is there room in your freezer for my head too. Because gosh it’s hot. Ugh. Good thing we have pops! These are beauties!! Haha, well I can’t say I blame the cats. It has been pretty hot around where I live too! These popsicles sound amazing! I JUST bought a popsicle mold and am DYING to use it! Wow! Love your photos! I want one now! This sounds and looks so refreshing! Every since I got my popsicle mold, I can’t get enough of popsicles this summer. They are incredibly refreshing from the simplest of recipes to the more complex. I’ve frozen new pops at least once a week! So I can see how you’d eat five in one setting. I get it! Our local figs and blackberries aren’t quite ready yet, but I’m dreaming up way to enjoy them once they are. Thank you for your inspiration and giving me another way to cool off! These pops are gorgeous! This is one of the most interesting ingredient combinations we’ve seen throughout popsicle week! Would love to try it soon, wondering where in stores I could find the Kadota figs? Yes! I never realised creative you can possibly get with popsicles… until #popsicleweek! Best idea ever?! Yours look incredible, Sarah!!! You always have the best flavor combos, Sarah. I would happily, and hungrily destroy these!! Bahahaha, they look like Barney! So true! Kadota figs are actually my favorite. I feel like they have a cleaner sweet taste compared to missions and calymrynas. I could be totally wrong about this. Also, whoa. Why on earth was it so hot in the Bay Area last week and why are apartments around here not air conditioned? I was such a sweaty mess when I tried cook and shoot stuff for the blog. Baking all day sure didn’t help. Wish I had one of these lovely popsicles too cool me off! The prettiest popsicle award goes to… YOU! These are stunning Sarah! Truly beautiful and I can only imagine how magical they taste! I am in love with these popsicles, Sarah! 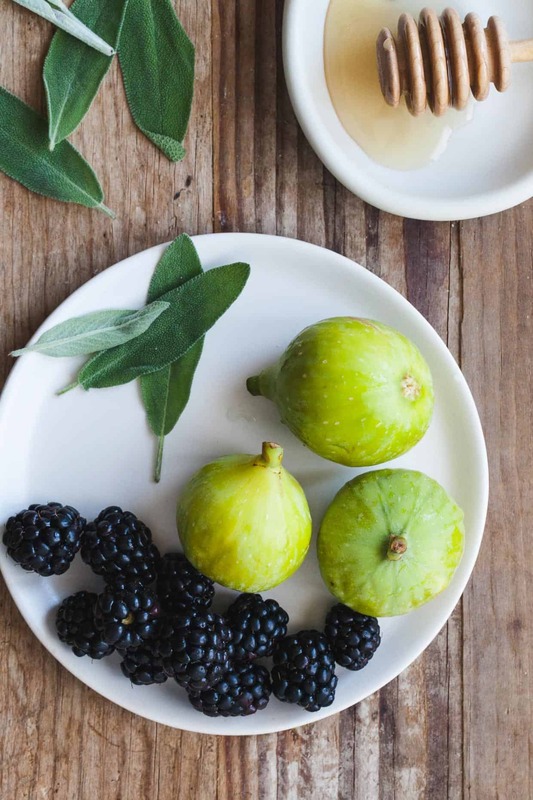 Blackberries and figs together already sound like such a winning combo, and then the addition of sage — beyond perfection. Such summery beauties! 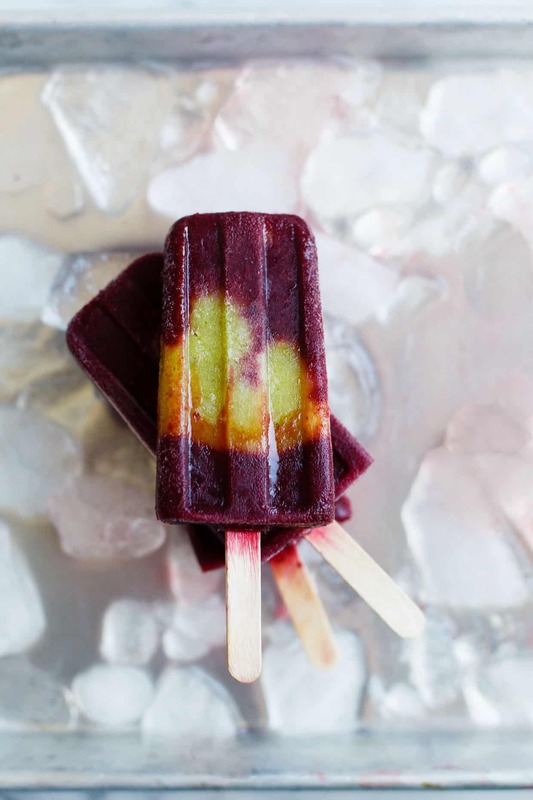 These popsicles are just as pretty as they are flavorful! Raspberries and blueberries are also a good substitute for blackberries if you don’t have any on hand. I also like to use fresh spearmint instead of sage sometimes.